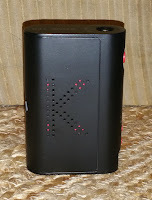 The vast majority of the reviews panned the newest generation of KBOXes. The Topboxes, 70, 120, and 200 all seemed to have flaws. DJLsb really disliked the SS TC, and, by now, most know that the Nichrome TC is a flameout... literally! The finish is cheap and tends to come off quickly, they say. And, I bought it anyways... Not only did I buy it, I planned it! Knowing that the box was black with red accents, I went out and bought a 528 Customs Monster V3 Blackout RTA (which is black with red accents) to pair up with it. if I must say so myself. The question that might spring to mind is: Why? The answer is price. It showed up for around $30 with a spanking new, married set of Samsung 25Rs and a few silicon sleeves. Still, I was prepared to be disappointed. On top is an oddly recessed, thin-walled stainless threaded 510 connection with a spring loaded center pin. The center pin looks to be brass or brass plated.Opposite the 510 is a subdued bit of branding - gloss black on matte black on mine. On the red and white models, the branding is black on white or black on red. On one side of the mod, the letter K is punched out to provide some minimal venting. Minimal because the punching is set up against the back of the battery sled. 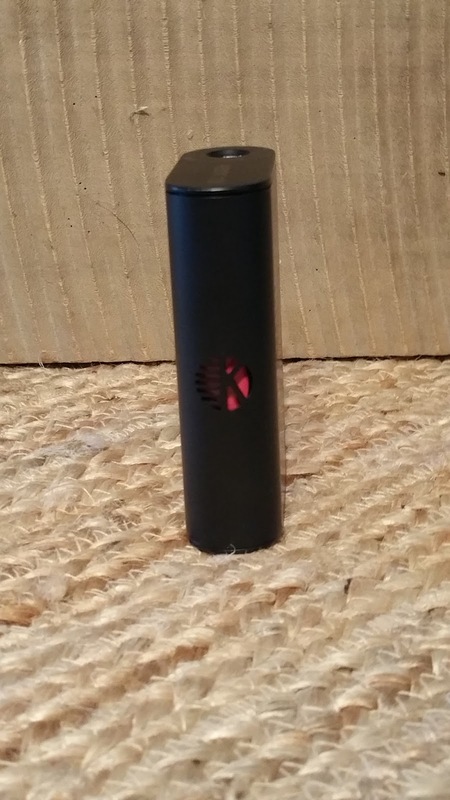 On the other side, there is nothing more than the Kangertech logo in a dull red on the matte black. That bit of branding, like the KBOX 120 on top, is in black on the red and white models. 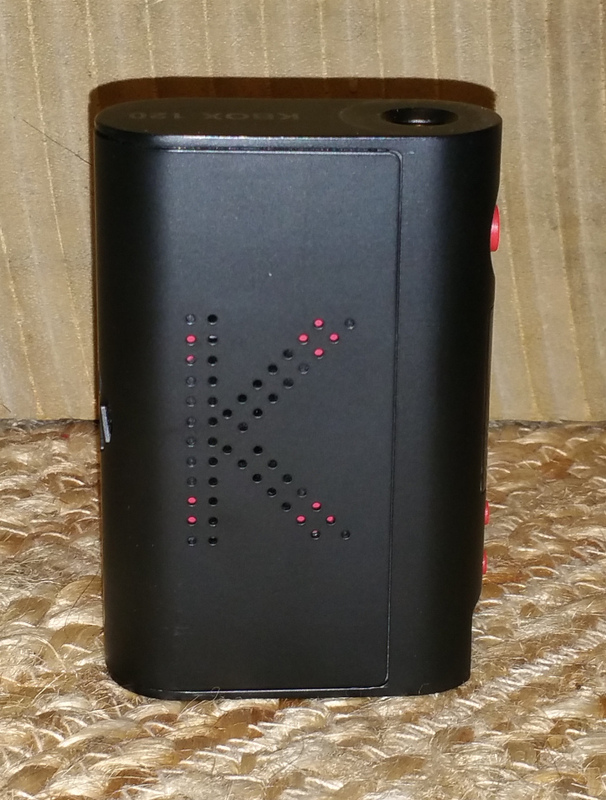 The back of the mod features some additional branding and venting in the form of the circular lines and K cutout found on all Kangertech mods. In the box are some of those black battery stickers that might get used if I cared about the battery peeking out. I don't, but I have thought a lot about getting a set of LG HE42 batteries just so I would have red showing through (and I did... sheesh, my OCD...). 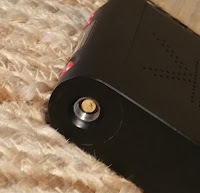 The back and both sides of the mod described thus far are all situated on a U shaped piece of aluminum that slides off to reveal the battery tray. There are no magnets. The door is held in place by a set of ridges on the inside of the door that match with a set of grooves on the mod. 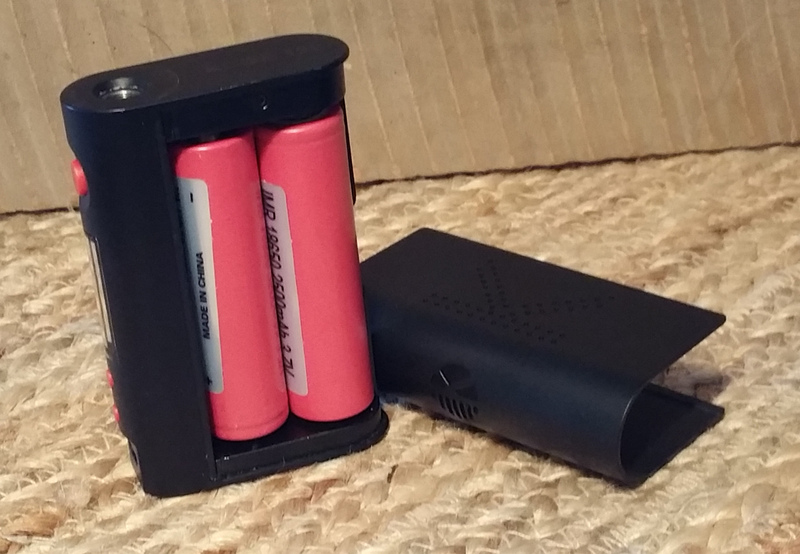 The battery tray is a simple molded plastic affair without any ribbon. Instead, finger grooves are provided for both batteries as well as four small holes in the backside (underneath the punched K when the door is on). The contacts are nicely marked with stamping in the plastic. The upper contacts are fairly beefy spring-loaded pins, and there are two largish contacts on the bottom. A single screw above the top contacts. front and back, is the only sign of fasteners inside the mod. 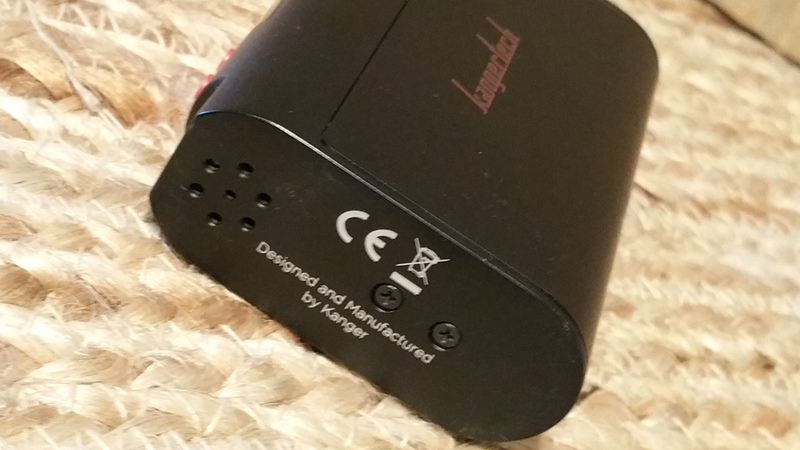 The bottom of the mod has some additional venting - beneath the chip this time - two screws, the CE logo, the "Don't vape in trash bins" symbol, and the sentence "Designed and Manufactured by Kanger." The screws on the bottom are the only fasteners found on the exterior of the mod. The control surface, found under the 510, has a red plastic fire button situated in a shallow dip. The surface of the button is fairly flush with the surface of the mod, but easy to find and use because of that dip. Beneath the fire button is the screen. 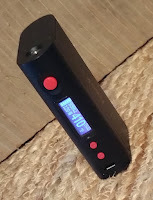 It's a fairly large screen and displays a battery strength bar broken down in to 5 segments, The resistance is displayed to two decimal points above the applied voltage (in variable wattage mode), or wattage (in TC mode). Next to that, the wattage or temperature is displayed. Finally, the TC mode is displayed above the temperature unit (C or F), or is left blank above the W for wattage. Then there are two adjustment buttons that are marked with a plus and a minus. Finally, there is a USB port that is supposed to be used for firmware upgrades and charging. I do not recommend charging any series box via a USB port, but this one appears to be pretty balanced. Currently, there are no firmware updates available. Note that the buttons on the white and red models are black instead of red. The mod measures 84 mm x 56 mm x 22 mm. It's light, being made out of aluminum and plastic. That doesn't mean cheap, though. There is no rattle, and all the pieces parts seem to fit nicely together. The device will fire down to 0.1 in power mode, and down to 0.05 in TC modes. The wattage range is from 7 to 120 in 0.1 watt increments. Once either adjustment button is pressed and held, the adjustment kicks up to 1 watt increments. It's still a long trip from 7 to 120... the accelerator could use some giddy-up. In TC modes, the temperature adjusts in 1 degree increments until a button is held down. Then it jumps to 10 degree increments in either Celsius or Fahrenheit. Oddly enough, the wattage does not round robin in either direction, and the temperature only round robins downwards, switching at the bottom of either range to a non-corresponding alternate value. Confused? The range is from 100 to 315 Celsius, and from 200 to 600 Fahrenheit. When scrolling down in F, after 200, the screen displays 230 C. When scrolling down in C, after 100, the screen displays 450 F. At either of those points, it is easy to scroll upwards, but when the top is reached, that's it... no more... until the downward adjustment is started again. It is not possible to adjust the wattage in TC modes. The wattage in these modes acts as a preheat and is pegged at 120 Watts. To switch between modes is quite simple. Three click of the fire button switches from, in order, variable wattage to Ni (for Ni200), to Ti (for Titanium #1), to NiCr (for Nichrome, but don't believe it for a second), to SUS (for Stainless Steel 316L), and round robins back to wattage. To turn the mod on or off, it's 5 clicks of the power button. Clicking the mod more than 5 times does not reveal any easter eggs as it does with many other mods. Rather, 10 clicks will turn the mod off, then on, or vice versa. Pressing the up and the fire button inverts the screen. Not flips, inverts. Blacks become whites and whites become blacks. Kinda cool, actually. Pressing the down and fire button does nothing. Sorry. Pressing the up and down buttons flips the screen. Pressing all the buttons locks the adjustment buttons, but the device will still fire. Pressing any button, or combination when the device is off will simply cause the screen to helpfully display "OFF." That "OFF" is also displayed when turning the mod off. "KangerTech" is displayed when turning the mod on. 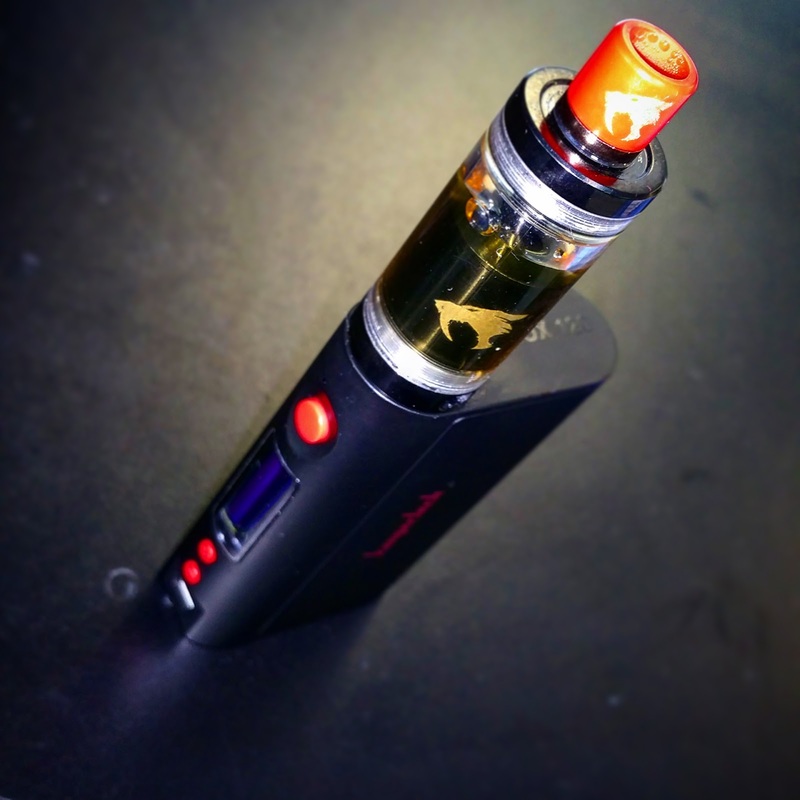 Unfortunately, that helpfulness falls short when something like a short or low atomizer is detected. Then there's just flashing the Ohms display at 9.99 Ohms. 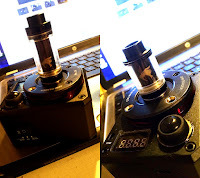 I have seen this mod going for anywhere between $30 (a steal) and $85 (highway robbery). If this is mod sparks some interest, a little Google-fu or a trip to Vapecrawler.com will serve up the goods. Since the mod arrived shortly after the tank I bought specifically for the mod, I have used no other RTA, RDA or Clearo on this mod. In the Monster V3, I have tucked some Ti#1 coils for a couple tanks, some Ni200 for a couple tanks, some Kanthal for a couple tanks, and finally, some 316L stainless steel for the last several tanks. The SS coils have been run in both power and TC mode. I have not tried, nor will I try, and NiChrome coils in TC mode. With all coils, I felt that the device performed acceptably. I think it's calibrated a bit on the warm side, to be honest, but I have yet to get a dry or burnt hit in TC mode when I've dialed it back a bit. When cranked up to my normal 420 to 450, it's a bit too warm. That might be because of the smaller chamber on the Monster V3. One thing I have been very impressed with is the battery life on this mod. Using Samsung Baby Blue 25R batteries, I am getting a solid 2 days of vaping. I could likely get a little more, but I don't want to run the risk of going dead without a set of spares on hand. Speaking of the Monster V3, I like it a lot. 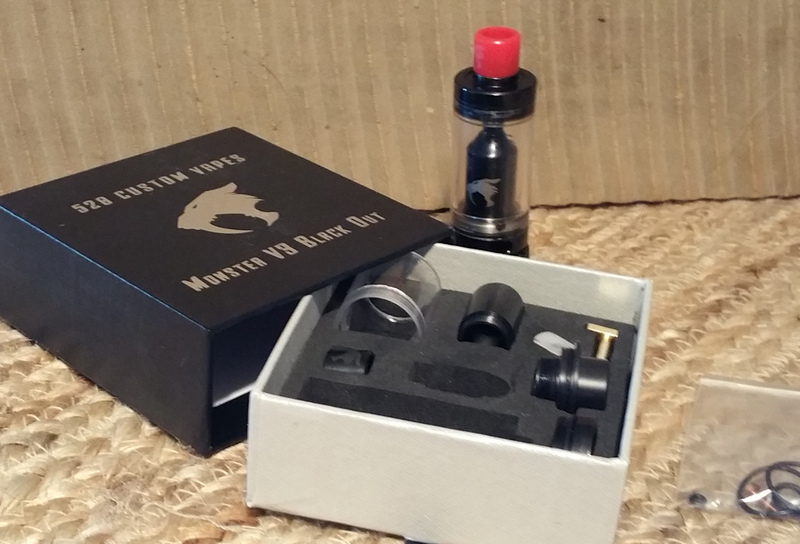 for those not familiar with the Monster V3, it is an RTA crafted and sold by 528 Customs. They've wiggled themselves into the spotlight recently with the release of the Goon RDA. Before the Goon, though, they got their start modding Kayfuns by drilling them out and increasing the airflow and juice channels. With the V3, they gave up modding existing tanks and made one of their own. The Monster V3 is still heavily influenced by the Kayfun Light and V2 line, right down to the bottom fill screw, but features a set of deceptively large, non-adjustable airflow holes, a pair of gold-plated positive pins that are much larger coupled with copper 510 pins (that I would not adjust), really deep juice channels, and larger headed screws on a standard Kayfun deck. 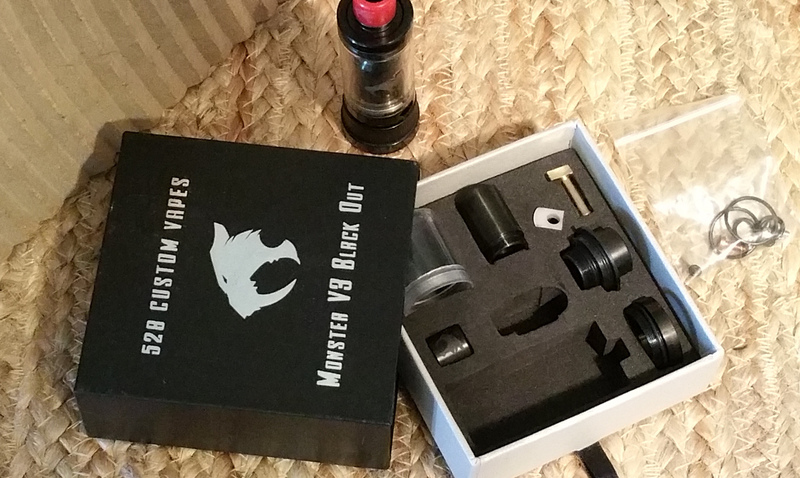 The Monster V3 Blackout Edition comes with a HUGE replacement chimney (it's basically the same size as the chamber), a chuff top, a drop kit (smaller tank eliminates the chimney - the chuff attaches to the chamber), both a 3.2 mm center pin and a 3.8 mm center pin with accompanying 510 screws and insulators, and a single drip tip with two drip tip slip covers - one red and one black, both with the sabertooth tiger logo. That same logo is on the chamber. Also in the box are a couple spare screws, and o-rings. Building on the Monster V3 is a cinch. I've had no issues trapping any wire I've used (28, 26, and 24 gauge). I even think it might be possible to trap a small set of Claptons in there. The draw is either very open mouth to lung, or very restrictive direct to lung. That's not going to appeal to everyone, but it's nice to have a single tank that I can take out for a day and vary my vaping style a bit without making any adjustments. I've also had no issues filling the tank in spite of the bottom screw fill hole. The hole for the screw is large enough to fit a blunt nosed plastic bottle, or the tip of a dropper. The tank is polycarbonate, so I do have to watch what liquids I use. It's durable poly, though. I forgot and ran a couple tanks of banana through it and there's no etching or cracking. I'm certain my Monster is a clone. It's a high quality clone, but a clone nonetheless. I snagged it off of eBay for $18. The authentic from 528 Customs - when it is in stock - sells for $100. Honestly, I'm very close to saying it's worth it. This is a very nice RTA! It's even presented nicely in a simple, sturdy black box with silver logo and lettering. The insides of the box slide out with a pull tab and all of the pieces parts are neatly tucked into a foam liner. Nice, but not perfect. I'm not going to run through the entire grading cycle with this RTA, but I will list out some pros and cons. So what about the mod? I thought that question would never get asked! Form: 9/10 - The mod is quite comfortable to hold and use. The buttons are easy to find, well marked, and do not shift when the screen is flipped. Honestly, I took off a point because of the funky 510 even though it seems to function fine. It bothers me. On the other hand, the display is quite bright and legible. Function: 8/10 - The mod appears to be slightly off in TC modes, and promises, but spectacularly fails to deliver, TC over NiChrome. The menuing system is a bit odd, too, and does not seem to cover all the bases. Final: 8/10 - Solid B and worth owning if you don't plan on using NiChrome in TC and don't mind the inevitable chips in the finish.